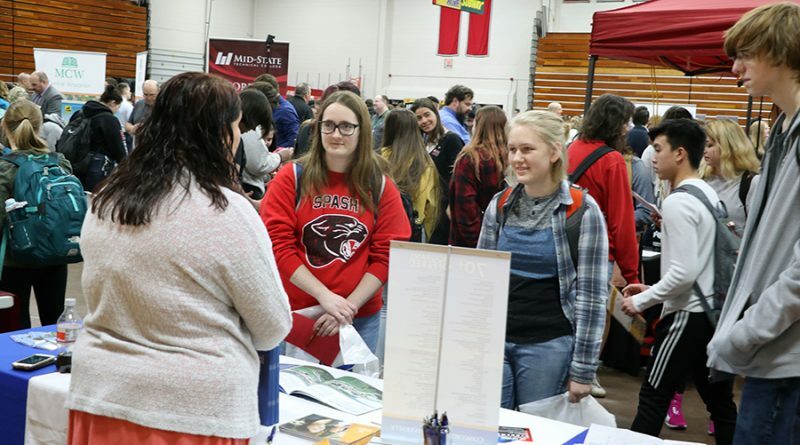 Area students and their families are invited to SPASH’s 12th annual College and Career Fair on March 13. The event will be held twice that day, once in the early afternoon for SPASH juniors, and a public session for students in grades 7-12, and their parents, from 4:30-7 p.m. The event is being sponsored by the SPASH Counseling Office and Career Center and the Portage County Business Council and will be held in the SPASH Fieldhouse. Over 100 exhibitors will be in attendance including colleges, branches of the military, apprenticeship programs, and area businesses. Admission counselors, teachers, and area business owners will feature exhibits and presentations designed to assist students in learning more about programs of study, apprenticeships, financial aid, military options, careers, and more. Mid-State Technical College will also have their bus called the “MIKE” (Manufacturing, Innovation, and Knowledge Experience) on hand. The 40-foot RV-style bus incorporates a mobile computer lab, laser measuring system, 3-D printer and small scale Haas CNC milling machine. The event is free and open to all students in grades 7-12 and their families, including students from surrounding school districts, as well as parochial, private, and home school students.